Painting your furniture can breathe new life into a room at a fraction of the cost of buying new furniture. 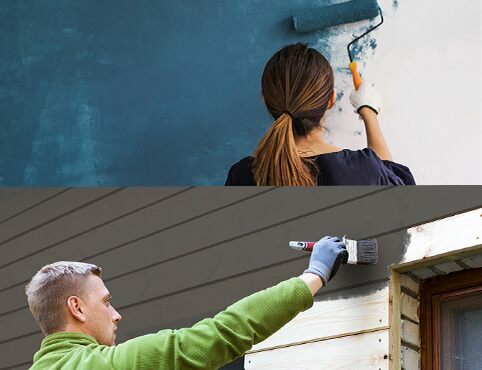 With the right preparation, high quality paint and the just-right paint colours, a makeover of your favourite piece is within reach. From the classic Simply White OC-117 to the dramatic Black Beauty 2128-10, you’ve got 3,500+ colours to choose from. Repaint a dresser, chairs, a wooden bed frame or a battered coffee table, and your favourite painted wood furniture will enjoy a colourful second life. When it comes to repainting furniture, the surface needs to be clean, dry and ready to accept paint. Use a gentle grease remover to remove any grime, then follow with a fresh water rinse to make sure the surface is clear of any remnants of the cleaner. Use a damp sponge for a final wipe down, and let everything dry thoroughly. After cleaning and ensuring the piece is 100% dry, it is time to sand. Using a medium sandpaper (we like 100- to 150-grit), sand down your surfaces a little—not enough to sand away the current finish entirely, but enough to give the primer a little more grit to stick to. Wipe away any dust with a slightly damp cloth, then let dry. Make sure you repair any cracks, joints, or nail holes with a good wood-patching compound. After the compound has thoroughly dried, sand it down to make it even with the surrounding wood. ADVANCE® Interior Primer (K790) has great adhesion for wood surfaces, providing the proper foundation for any ADVANCE finish. Plus, it can be sanded and levels well, ensuring a smooth finish and helping to mask minor imperfections. Painting furniture a darker colour? Use a tinted primer as your base. Sheen is an important consideration in addition to the colour. To help camouflage minor imperfections, or to give a vintage flavour to your piece, a lower sheen is a good choice. For a sleek, modern feel, a high-gloss gives a design edge. Furniture takes more abuse than the typical wall, so the best paint for furniture is Benjamin Moore’s ADVANCE Interior paint, which offers multiple sheen options to suit your aesthetic: matte, pearl, semi-gloss or high gloss. Professional painters prefer ADVANCE Interior paint for painting wood furniture: it offers a durable, furniture-like finish that is easy to apply and easy to clean. ADVANCE works beautifully for painting laminate furniture as well. 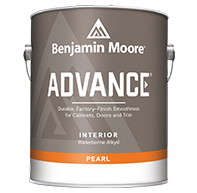 You can find ADVANCE exclusively at your local Benjamin Moore retailer, where ADVANCE is available in all 3,500+ colours Benjamin Moore has to offer. Tip: It is easy to miss areas when you are painting furniture, so if possible, raise the piece onto a table top surface so you can easily view from all angles to ensure no spots are missed. Furniture takes more abuse than the typical wall, so the best paint for furniture is Benjamin Moore’s ADVANCE Interior paint, which offers multiple sheen options to suit your aesthetic: matte, satin, semi-gloss or high gloss.